Earlier this spring, the Rombauer Chardonnay was recommended to me by a speaker who was wrapping up a highly successful webinar for dental students across the U.S. It was her celebratory drink and one she often served to friends new and old, and I can totally understand why. It’s one of the best I’ve ever had, a natural comp to my friends at Buena Vista and their most excellent Chardonnay. 2013 Chardonnay, Rombauer Vineyards, Carneros, Napa, California, USA. Earlier this spring I saw the wine available through an online shipper but declined that first time. When I saw the Rombauer shelved at my favorite wine shop (I was there for the Caymus tasting), I knew I had to pull a bottle and give it a go. My first mistake was buying only one, but it goes back on a short list for next time. The 2014 vintage is fantastic, the commensurate hint of butter to be sure, but mostly a melon scent that is refreshing even on the nose before you taste it. It pours golden in the glass, much richer in tone than a Grigio, and layers in other citrus smells that I can’t quite put my finger on. It’s bright and sweet, but not sticky sweet like the Riesling recently covered here in Notes (only click if you want the contrasting opinion), and you almost feel like you could drink it after a hot summer day or workout. Thanks, Rombauer Vineyards, for the helpful details on your delicious wine. Queso tostadas with summer vegetables and a spicy cream sauce. It’s easy to think Notes focuses exclusively on grilled steaks and red wines, but that’s only partially true. The blog does share occasional feedback on whites, and sometimes shares great foodstuffs that far outshine the grapes. This is one of those times. 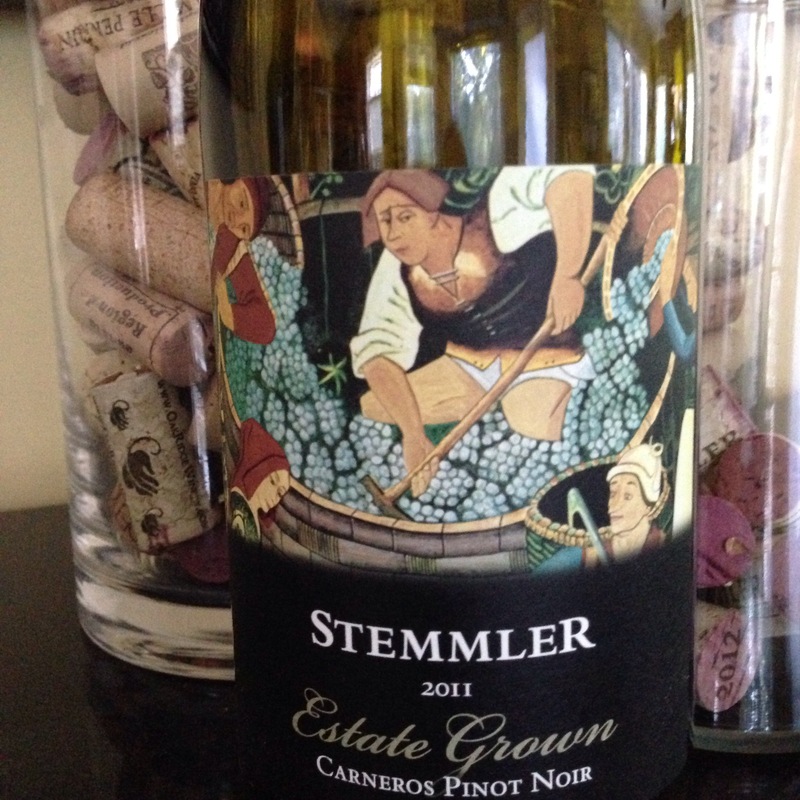 2011 Robert Stemmler Pinot Noir, Los Carneros, California, USA. The 2011 Robert Stemmler is a great Pinot Noir; no question about it. No rough edges, it is light berry and polished all the way, a rich and fragrant treat any night you uncork one. On this evening, it accompanied a special meal–cheese grits, sautéed shrimp, Italian sausage, and a mix of red, yellow, orange, and green peppers. Swirled all together and topped with home-grown parsley and chives, this was an immensely enjoying evening; it had just the right punch of heat to offset the cheese (and yes this was my first cheese grits tasting experience). Great textures, intoxicating blend of hot and cold, and medley of colors…a good night for the memories. Change of pace from all the reds and my love of them is the 2013 Trader Joe’s Grand Reserve Lot #51 Chardonnay, a California-bottled citrusy white that we picked up…well…obviously. Selected and opened by family earlier in the week, I only revisited it myself as our meals lined up as fish and chicken over the last couple days. 2013 Trader Joe’s Grand Reserve Lot #51 Chardonnay, Napa, California, USA. There’s definitely some floral stuff happening here; some pear and peach perhaps too, all working together in oak to produce a light, buttery taste. I know my folks are fans of both oak and the buttery effect, and that they left some of this bottle for us means they either had their fill of spirits (all good!) this weekend or simply ran out of time. I’m betting the latter. The Lot 51 Chardonnay first accompanied tuna steaks (slightly more well done than intended, but expertly seasoned) with white rice and steamed broccoli. I liked the role of this Carneros chardonnay within this meal as I thought it mixed well between bites of our fish and its spices. I enjoyed it so much that I reached eagerly for it tonight as well, both to ease my nerves after a pressure-filled work day and to complement one of my favorite meals–chicken piccata with penne pasta. This meal was my go-to for some time at Rosario’s, our favorite NJ neighborhood Italian jaunt. Regrettably, the webcast I was moderating took a bit longer than anticipated and let the white wine and caper sauce lock up just a bit, but it still made for a nice little feast by the time our speaker finished up her presentation. The 2013 Trader Joe’s Grand Reserve Lot #51 Chardonnay is bottled by BC Sellers of Napa, California, and would be an acceptable if not spectacular white gracing your table one of these future evenings.